Proprietary Name: Leader Childrens Pain And Fever What is the Proprietary Name? 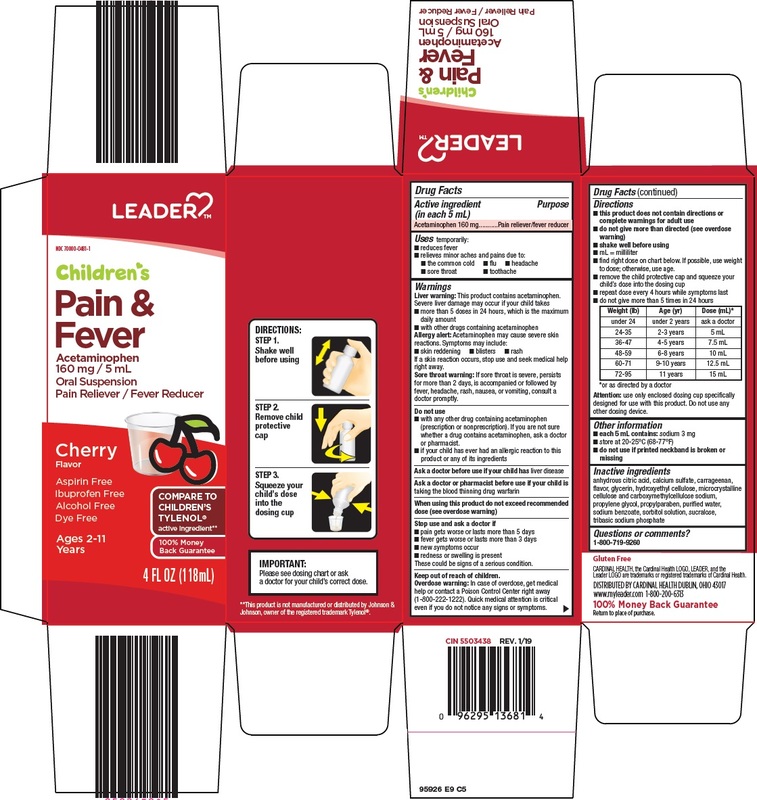 Leader Childrens Pain And Fever with NDC 70000-0481 is a a human over the counter drug product labeled by Cardinal Health. The generic name of Leader Childrens Pain And Fever is acetaminophen. The product's dosage form is suspension and is administered via oral form. Liver warning: This product contains acetaminophen. Severe liver damage may occur if your child takes •more than 5 doses in 24 hours, which is the maximum daily amount •with other drugs containing acetaminophenAllergy alert: Acetaminophen may cause severe skin reactions. Symptoms may include: •skin reddening •blisters •rashIf a skin reaction occurs, stop use and seek medical help right away.Sore throat warning: If sore throat is severe, persists for more than 2 days, is accompanied or followed by fever, headache, rash, nausea, or vomiting, consult a doctor promptly. •pain gets worse or lasts more than 5 days •fever gets worse or lasts more than 3 days •new symptoms occur •redness or swelling is presentThese could be signs of a serious condition. •this product does not contain directions or complete warnings for adult use •do not give more than directed (see overdose warning) •shake well before using •mL = milliliter •find right dose on chart below. If possible, use weight to dose; otherwise, use age. •remove the child protective cap and squeeze your child’s dose into the dosing cup •repeat dose every 4 hours while symptoms last •do not give more than 5 times in 24 hours Weight (lb)Age (yr)Dose (mL)*under 24under 2 yearsask a doctor24-352-3 years5 mL36-474-5 years7.5 mL48-596-8 years10 mL60-719-10 years12.5 mL72-9511 years15 mL *or as directed by a doctorAttention: use only enclosed dosing cup specifically designed for use with this product. Do not use any other dosing device.